As you're buying plywood, calk, rations, and cowering in fear, some guys are wringing their hands in anticipation. Surfers. Hurricane season is what east coast surfers absolutely live for. Yes, right now, as most people are fleeing coastal areas, there are surfers in the water. Why? Because the east coast gets very little swell during the summer months (it's been flat for friggin' weeks! ), unless a hurricane rolls through. Hurricanes generate a tremendous amount of fetch over a large area, and that translates to thick, powerful, "long-period" waves. The swell forecasting site Surfline has a great article today about the science behind how guys score hurricane waves, and there's a ton of very sophisticated technology involved. It's important to note that people don't generally surf while the hurricane is actually passing overhead—the high winds make it way too choppy to be ridable (not to mention the massive rip currents and just, y'know it's a hurricane!). Good waves typically proceed and follow hurricanes, though. 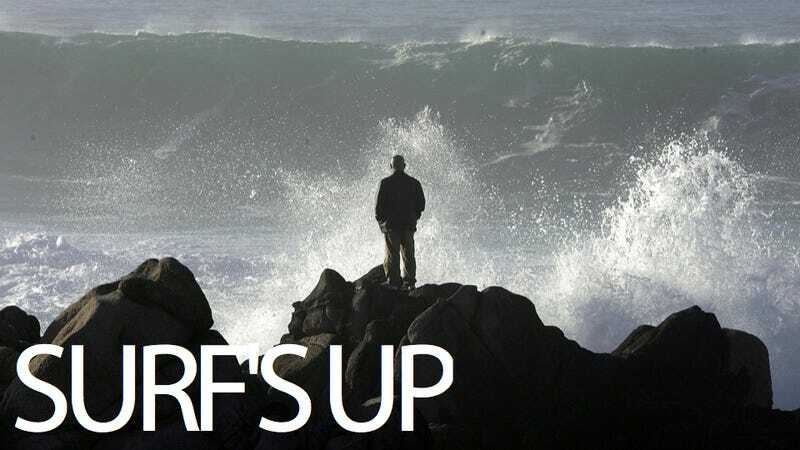 Take a look at the current forecast from Surfline. Size ain't everything. See those arrows below that turn purple on Sunday? That's wind. That's a hell of a lot of wind. Anyway, I highly recommend checking out the article at Surfline, not just for the easy-to-understand science, but for the killer photos of east coast surfers riding some very serious hurricane swell. My friends are trying to get me to go out with them today. I love a challenge, but they're friggin' dreaming. Plus, Joe Brown said he'd fire me if I went. If I didn't die. Which I probably would. UPDATE: Surfline now has a feature called In the Eye of the Storm: Irene. If you want to see some amazing images of people surfing Irene, check it out. And as of 2:10pm there are still guys surfing on Long Island. And my friend is still trying to get me to go. No means no.